I hope you are treating yourself to some Chocolate Covered Coffee Beans! 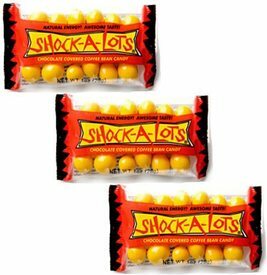 TRY our Shock-A-Lots®....Chocolate covered, candy-coated, hyper-caffeinated, Shock coffee beans. That's a mouthful. And, eating a mouthful of these is about the equivalent of putting one cup of coffee in your mouth. No time to brew coffee? On the run? Ready for a workout? Here ya go! And the best part is...these are way tastier (no lie) than ANY OTHER CHOCOLATE COVERED COFFEE BEAN YOU'VE EVER HAD.